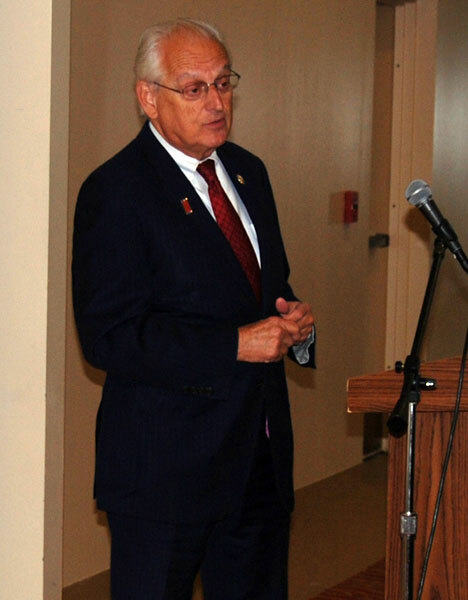 Rep. Bill Pascrell addresses the breakfast gathering of legislators and Jewish community leaders at the West Orange JCC. 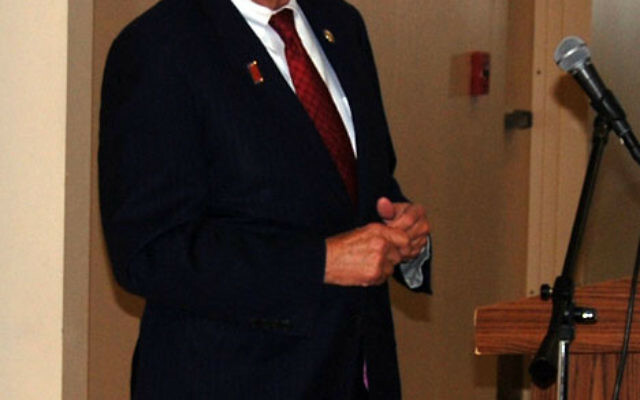 Passaic Assemblyman Gary Schaer criticized President Barack Obama’s recent remarks on the Middle East during one of the more pointed exchanges of a May 20 meeting between area lawmakers and Jewish leaders. Over coffee and bagels in West Orange, local political leaders and Jewish community activists shared views on the topics of top concern to the Jewish community — primarily the need to stand up for Israel and against the Iranian regime, and the battle for funds for Medicaid and aging-in-place programs. Eleven lawmakers from various levels of local, state, and federal government accepted an invitation from the Community Relations Committee of United Jewish Communities of MetroWest NJ and the Jewish Community Relations Council of the Jewish Federation of Central NJ. Participants included over 60 lay and professional leaders from Central and MetroWest, who gathered at the Leon and Toby Cooperman JCC, Ross Family Campus. A number of the speakers expressed their respect for Obama but distanced themselves from his remarks made the day before, calling for a peace settlement between Israel and the Palestinians based on Israel’s pre-1967 borders and agreed-upon land swaps. Schaer (D-Dist. 36) said he was disappointed in the president’s remarks, and — like many of the others present — stressed that peace negotiations could be held only with those parties that recognize Israel’s right to exist. There were light moments — like when U.S. Rep. Bill Pascrell (D-Dist. 8) greeted State Sen. Richard Codey (D-Dist. 27) as “Governor,” and Codey responded by calling him “Senator.” But for the most part the tone was earnest. The budget loomed large in all the remarks. Underlining the fact, as Assemblywoman Nancy Munoz (R-Dist. 21) pointed out, that New Jersey has one of the largest debts per capita in the nation, the speakers agreed that painful cuts are unavoidable, but they stressed the need for constituents’ voices to be heard and their priorities acknowledged. Assemblyman Tom Giblin (D-Dist. 34) mentioned an area of overlap between the two groups at the breakfast, saying there had been an erosion in the number of Jewish leaders involved in local politics in the greater Essex area. He emphasized the importance of being pro-active in public service. The legislators were provided with other reminders of Jewish priorities. “No Nukes for Iran” buttons were placed on every table. A few speakers mentioned their encounters with teenagers active in the No Nukes for Iran movement and praised their energy and commitment. Other handouts dealt with the Darfur Education Project, run by the NJ Coalition Responds to the Crisis in Darfur, and cuts to funding for non-public schools. A letter from the Jewish Educational Center in Elizabeth, distributed by its executive director, Steve Karp, discussed the state’s elimination of the Technology Initiative, which provided funds for non-public schools. “These funds allowed us to purchase computers and to provide nursing care in our buildings,” it said. Karen Alexander, UJC MetroWest’s director of Eldercare Services, had praise for one of the lawmakers, Freeholder Pat Sebold (D-Essex), and her support for aging-in-place programs. Sebold serves on the boards of trustees of UJC MetroWest and the Jewish Community Housing Corporation. Alexander said Sebold, who was present, made contacts that opened doors, leading to the establishment of Verona LIVE (Lifelong Involvement for Vital Elders), an extremely successful partnership offering a range of services to make life better for seniors in the town. Steve Newmark, chair of the government affairs committee of the MetroWest CRC, opened the program. Others delivering remarks included Gary Aidekman, UJC MetroWest president; David Dranikoff, chair of the CRC’s Israel and world affairs committee; and Gordon Haas, chair of the Central federation’s JCRC.